So, now that I've wrapped up my current research trip among the Tolkien papers in the Marquette Archives, I'm amazed as always by how fluid and flexible the story-line of LotRs was when Tolkien was drafting the book. What really strikes me this time are the small details that seem so out of place, when their spurious sense of inevitability only comes from the fact that Tolkien did in the end pick A instead of B at a given spot. Like the statement that Bombadil cd have destroyed the Ring, had Frodo but asked --shades of PARZIVAL, perhaps? Or his idea of making the Stone of Erech Aragorn's palantir? Or the mention of Fingon in the Shelob chapter, along with Beren and Turin. Beren and Turin were kept while Fingon was removed --why? Or, to turn the question the other way around, why was Turin kept? Beren and Earendel were famous spider-slayers; Turin seems included as the mightiest of all human warriors. Or my current favorite, the oddly endearing statement by Frodo that Gollum is night-eyed but near-sighted. I now have a mental image of poor Smeagol with spectacles that I don't think is going away anytime soon. And in other news, Mr. Mousey, one of my favorites of all the cats to have passed through the cat-room, finally got adopted. Here's hoping he's finally found his happy ending after many months of waiting. --today's song fragment stuck in my head --'in the lobby of a downtown hotel'--eventually expanded itself out to be recognizable as "The Ballad of Danny Bailey". go figure. current reading (kindle): Evangeline Walton's novelizing of the Fourth Branch of the Mabinogi, which I expect to get me through a good section of my plane ride home tomorrow. So, here's what climate change looks like. Up until a few days ago East Island, an outlier on the northwest fringe of Hawaii, in a group known as the French Frigate Shoals, was mainly known as a wildlife refuge. That was before it disappeared, submerged after the battering it took from a recent typhoon. Before the storm it was about half a mile long and 400ft wide; all that is now underwater. Anyone else reminded of Verne's Lincoln Island? current reading: Tolkien manuscripts, R. H. Benson's THE NECROMANCERS (a Charles Williams novel before there was Charles Williams, except rather better). So, today begins the last week for the TOLKIEN: MAKER OF MIDDLE-EARTH exhibit at the Bodleian. So if you're able to go and hadn't made up yr mind, it's now or never. The splendid Exhibit closes on Sunday the 28th. Even at this point all is not lost, since a slightly trimmed down version of the exhibit opens at the Morgan in New York on January 25th, allowing those in the New England to DC area a in-the-vicinity chance. And of course for continental types the third and final staging of the exhibit will follow at the Bibliotheque Nationale in Paris, but I don't yet have the dates on that. --current reading: COME ALONG WITH ME by Shirley Jackson and "The Summer People" ibid. So, yesterday while driving down to Harvard, Illinois, we drove through a kind of weather I'd never seen before. It wasn't oobleck, but it was strange enough to make me think of one of those articles they occasionally used to run in the FORTEAN TIMES about rare weather events that occur but not often enough for people to recognize them when they do. We were going warily, having had to detour around the pieces of a split-open fallen-apart fallen tree tangled up with a downed power line while coming through Williams Bay. We'd gotten as far as Walworth when Janice noticed that the fields to our right --that is, to the west-- looked odd. It was almost as if they were covered with fog. But you don't get fog in a high wind, at least not in these parts. There was no smell of smoke. We had no precipitation hitting the windshield yet we cd see what looked like a thin cover of drifting snow blowing across the highway. It wasn't until we pulled over for me to make a quick dash into a roadside convenience store that things came together. The wind, which was coming in hold-on-to-yr-hat blasts, was suddenly full of tiny snow pellets that looked exactly like fake snow. That is, they looked like tiny individual specks of styrofoam, except these were perfect little spheres. So, an unusual sight, and one I'm glad to have experienced. So, thanks to friend Denis I heard the news about the new Le Guin (thanks, Denis). According to the write-up on Amazon, this thousand page tome collects together the three volumes of the classic Earthsea trilogy, plus the three lesser and later books, plus the two original short stories that preceded even A WIZARD OF EARTHSEA ('The Word of Unbinding' and, even better, 'The Rule of Names', a real masterpiece by a master), plus an essay (lecture) on the series, plus two new stories I've not read: 'Firelight' and 'Daughter of Odren'. These days I'm finding it easier to read individual works rather than read the same work in an impressive omnibus (one of the reasons I got rid of the great big book of Amber), but those with younger eyes and love of Le Guin's work will definitely want this on their shelves. So, I was bemused by an article in a recent NEW YORK TIMES about how White Supremacists were seizing upon lactose tolerance as a sign of racial superiority. That, and being descended from Neanderthals. And yes, their arguments as described in the article are just as stupid as they sound. I think it'd do them a lot of good to read Steven Jay Gould's masterpiece, THE MISMEASURE OF MAN, an account of decades of (failed) attempts to measure human intelligence. So, when I put together the first post in this sequence, I hadn't noticed that there are several references to Sir Horace Plunkett, Dunsany's uncle, as well. In fact, Betjeman worked for Sir Horace briefly as his private secretary. And by 'briefly' I mean only for a matter of (I gather four or five) weeks in 1929. At the end of about a month Betjeman fell ill with a nasty flu. While he was in bed recovering,* he recommended a friend to fill in for him, and (long story short) the friend stole the job, offering as justification the opinion that Betjeman wdn't have been able to keep it v. long anyway. Needless to say, Sir Horace was not 'off his head', just clearly suffering from a bad case of writer's block. I've heard him described in all seriousness as one of the great men of his century for his devotion to improving the lot of farmers, particularly in Ireland through the Co-Operative movement. It says a lot about his character that when private airplanes came in when he was already an old man he had someone take him up so he cd better see for himself the patchwork of fields and farms and how they all fit together. As a result, he learned to fly himself when already well into his seventies. *this was back in the days, only a decade after the Spanish Lady, when folks took flu seriously. So, while looking up to see what Betjeman might have had to say about Tolkien, I quite forgot that Tolkien twice mentions Betjeman in LETTERS. of the D. Telegraph, during the absence of Betjeman. ignorant nor a gutter-boy. Peter Green seems to be both . . .
Betjeman to make on verse! From this I conclude that Tolkien seems not to have felt any animus against Betjeman and does not envy his success so much as he enjoys sharing in similar good fortune. As for Eliot, Tolkien seems to have largely ignored his existence. Although the two men's work once almost appeared in the same volume,* one gets the sense of contemporaries living in different worlds like, say, Virginia Woolf and Robert Frost. --current reading: that biography of Fr. Francis (almost done -- thirty pages to go), Tolkien manuscripts. **a piece of Tolkien's that we know Wms liked. So, my recent post on Betjeman and Dunsany was really a side-trek from my original intent, which was to see if there were any Tolkien references in Betjeman's collected letters. There was one solitary mention that I think's worth sharing, but it's in the context of Betjeman's thorny relationship with C. S. Lewis and thus requires some unpacking. In brief, Lewis had been Betjeman's tutor at Oxford, and the two men rubbed each other the wrong way. Without going into details, Betjeman blamed Lewis for B's Oxford career being cut short, and for taking steps to prevent his getting a teaching job elsewhere afterwards. In later years B. referred to CSL as ''My great enemy and ex-tutor Lewis' [p. 389; 1946] and '. . . Mr C. S. Bloody Lewis, the tutor who sent me down from Oxford' (p. 233, in a 1939 letter to T. S. Eliot, whom Betjeman addressed as 'Dear Poet'). The phrase 'mocks C. S. Lewis' even has its own entry in this volume's index. 'Oh God to be in England . . .
of a new book of poems of mine . . .
can think of it as 'cruising monthly' in a light canoe. must have seemed to the Berkshire workman'. 'I seen 'em myself', he said fiercely. *a precursor of 'there goes C. S. Lewis —it must be Tuesday', perhaps? So, in the work that I'm doing with the Tolkien manuscripts here at Marquette I came across something I thought I'd share. I have to stress that I was only able to work this out due to Christopher's already having provided the two difficult words without and further, and the ability to greatly enlarge the original without distortion or losing focus. As they say, on the shoulder of giants. So, another small piece of the puzzle for those who, like me, are happy with a new addition to our knowledge of Tolkien, however minor. Enjoy! Last Sunday I got to prove that it was true. When my friend Jim Lowder (who I knew before, during, and after our respective stints at TSR) suggested the possibility of getting together for a game, I immediately thought of the Walnut Room. While Jim made some invitations and gathered a group, I arranged through the hotel to reserve the room for most of the day Sunday (the 14th). I don't want to give the story away, in case Jim decides to run it again, but I can say I had a great time playing jazz musician S. E. 'Easy' Henderson and hope Chaosium will print it at some point. Here's a picture for posterity; thanks to Jim for sharing. I'm the one in yellow hoisting a cup of tea. 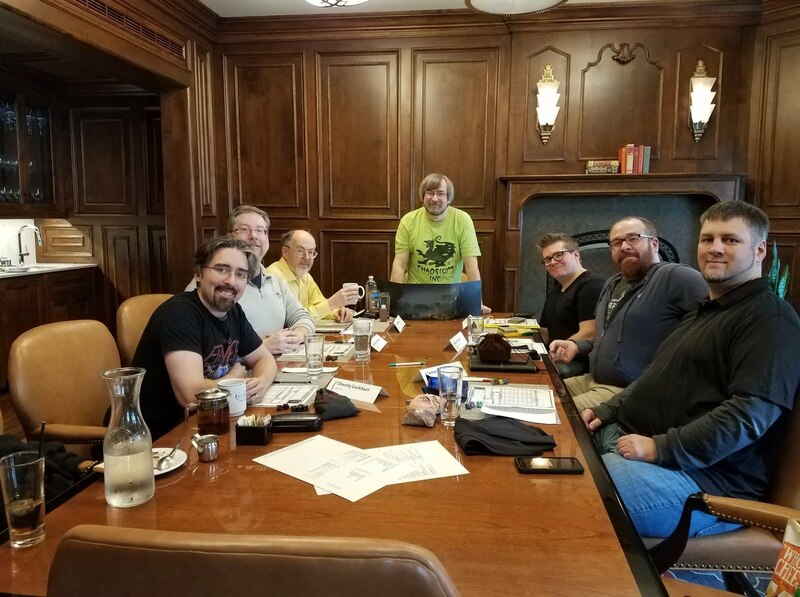 Jim is to my right, wearing the green Chaosium shirt. To my left is Dale Donovan, another TSR stalwart from the Old Days. Next to Jim is Ben Riggs, D&D podcaster, who's working on a book about the TSR/WotC buyout. The other three are members of Ben's group, whose names I'd gladly include if I'd thought to write them down at the time. Anyway, good gamers all. So, while I have the resources of the Marquette Memorial Library available to me in the down time from working on my main project (evenings and breaks), I was checking Betjeman's Collected LETTERS for any mention of Tolkien. There's only one sole allusion in the index, which I'd like to devote a post of its own to. But in addition to some things B. had to say about C. S. Lewis (which I expected) I fd several references to Lord Dunsany (which I did not). Not as scathing as his comments on CSL, for whom B. felt an abiding rancor, but not anything Dunsany wd have liked to see in print (or indeed out of it). Just what Dunsany's position was seems impossible to recover. I wd suspect it was Dunsany's views on modern poetry, but follow-up remarks indicate that the subject of the piece seems to have been 'the Englishman's approach to Ireland' (cf. the detailed outline on p. 384) and show that B. deleted 'remarks about the nuncio' and also deleted a reference to the idea that 'once a Catholic always a Catholic'. So far as the nickname 'Lord Insany' goes, this is not Betjeman's invention but was given to Dunsany (presumably without his knowledge) by fellow members of the English faculty of the University of Athens in the early days of World War II, or so I was told by David Abercrombie when I interviewed him in Edinburgh in 1987. Still, it's good to have confirmation, contemporary and in print. And it forms a useful mnemonic for those who can't remember Dunsany-rhymes-with-Rainy. And it's good to know that B. wholly approved of Lady Dunsany, who was a delightful person by all accounts. I thought it went without saying, but perhaps I shd emphasize that Dunsany was, of course, quite sane, he cd just afford to indulge his eccentricities. He had a number of strong opinions, such as being opposed to the mutilation of dog's tails, thinking that lampshades were on upside down (he felt they shd channel light up towards the ceiling, not down towards the floor), and a deeply held belief that table salt was dangerously adulterated (when on a visit he insisted his hostess provide him with ground up rock salt). As he got older, these became hobby horses, but nothing more. So heard the sad news today that Greg Stafford died. He was one of the foundational figures in role-playing games, a legendary figure of comparable stature with Gygax and Arneson and Petersen. He was not only the creator of PENDRAGON, one of the finest rpgs ever written -- I put it in my top three, alongside AD&D (1st edition) and CALL OF CTHULHU -- but also founder of Chaosium, one of the few companies from the early days of rpgs to survive down to the present and long known for being a class act in an industry where such a appellation was and is pretty rare. I'm glad I got to meet him once when he was down in Chicago for a visit, an event having something to do with the Arthurian journal AVALON TO CAMELOT. Here's a link to the Chaosium announcement. 'Louis Armstrong had so much talent he cd even make jazz sounds good'. So, thanks to Denis for another bit of film showing the unveiling of the Glorund tapestry and, as an added bonus, TANIQUETIL (The Halls of Manwe) as well, another of Tolkien's iconic paintings from the mythology. This clip, in French without subtitles, is just under two minutes in length; to see it, scroll down the page that pops up when you click on the link. This time Adam Tolkien puts in an appearance as well; nice to see them both. Thanks also to Druss, who in a comment on my earlier post sent a link that shows fourteen pieces of Tolkien art: five from THE HOBBIT, two from LORD OF THE RINGS, four from THE SILMARILLION, and three from THE FATHER CHRISTMAS LETTERS. What a great project. I look forward to the unveiling of new tapestries as they're completed. And I'm grateful to Denis for letting me know not only that such a project was in the works but this far along; many thanks. Having seen the originals of a lot of Tolkien's art at one time or another (most recently just under a month ago in Oxford), I'm all the more amazed when I think of how small a lot of his pieces are --those from THE HOBBIT are generally the same size as the page of the book they were designed to fit -- and how well they scale up. Magnificent. --in Milwaukee, starting up Week Two tomorrow. The Biggest Shock from First Reading THE SILMARILLION in Sept 1977: evil elves. So, I've been thinking back on the initial reception of THE SILMARILLION, and remembering how negative the reviews were and how no one challenged their demonstrably false claim that people might be buying the book but no one was actually reading it: that's not the conclusion that twenty-one consecutive weeks as #1 book on the NEW YORK TIMES bestsellers list wd normally lead to, it being far more probable that word of mouth kept people trying out the book in a widening circle all that fall and winter. Even so, the solution was easy: I started the book over again as soon as I finished, with the page in the back with the family trees bookmarked for easy reference during that re-read. Though truth to tell it was really only with the third read that I really started to get the hang of it. As for the story, The Silmarillion itself, I was struck by how many surprises it held even to the most diligent reader of Tolkien's earlier works already in print. For example, Feanor is mentioned several times in LotR, most notably in the palantir chapter when Gandalf wishes he cd have seen him at work in person. Here at Marquette I just finished reading the manuscript passage that brings in Feanor in a different context, as the one who made the Three Rings of Earth, Sea, and Sky: one text asserts that Feanor made the Three but it was The Great Enemy who brought them across the great sea to Middle-earth. Absent from any of these references was any indication of the evil that Feanor did, the long stream of deliberate heinous acts that ultimately destroyed his family and followers and the greater part of his people. And while he was the most evil elf depicted by Tolkien, he was not alone: many of his followers committed horrific acts as well. And yet no hint of evil elves had found its way into THE LORD OF THE RINGS, where the elves have put all that behind them. To use an analogy, who knew the Vulcans had once all been Romulans? *whom we learned much later, via HME, never reached Middle-earth at all but died along the way; he essentially becomes his twin brother's imaginary companion, so far as they story is concerned -- which does explain why the two never appear separately or undertake independent action anywhere in the main tale. **the intended effect, of course, wd have been to convey family kinship through nomenclature, as with Malory's names for the House of Orkney, the five brothers Gawain and Agravaine and Gaheris and Gareth and Mordred, where the first and last go back to much earlier stages of the legend and the others were added later by writers introducing spin-offs to fit a few more knights into an already crowded Round Table. So, thanks to friend Denis (thanks Denis), I found out about what might be named the Tolkien Tapestry Project, whereby the weavers at Aubusson, one of the world's great tapestry makers (who have been in business at least since the early 1500s), have recreated perhaps Tolkien's most iconic painting in tapestry form. With a little poking about on the internet* I turned up film of the unveiling of BILBO COMES TO THE HUTS OF THE RAFT-ELVES (aka THE FOREST RIVER). The film runs about six minutes and is in French with English subtitles. As a rarity the film features an appearance by Baillie Tolkien, who has usually kept a low profile but here does a fine job representing the family. There are also other handwoven Tolkien tapestries in the works: at the end they show a small piece of their next project, Glorund -- a curious choice (I wd have expected Smaug) but an interesting one. Only 7500 woman-hours of weave-work left to go! Dare I hope that somewhere down the line we'll see the fulfillment of one of my dreams: large-scale recreation of some of Tolkien's art -- THE FOREST RIVER, LOTHLORIAN IN THE SPRING, HOBBITON, SMAUG -- in monumental stained glass? And if so, where wd they be mounted? So, I mentioned in my last post that I was looking for a quote I recall from the George Bernard Shaw play SAINT JOAN, which I read some thirty years ago (along with MAJOR BARBARA, TOO TRUE TO BE GOOD, SHAKES VS. SHAV, and best of all HEARTBREAK HOUSE) and have never been tempted to reread since. Except that now I need the quote for something I'm working on, which I remember but not precisely enough for quoting --and besides, I need the page number and all for correct citation. "She never doubted that the sun went round the earth: she had seen it do so too often." While this conveys the same sentiment, it wasn't the exchange in dialogue I remembered, and lacked its sting. LA TRÉMOUILLE. And who the deuce was Pythagoras? THE ARCHBISHOP. A sage who held that the earth is round, and that it moves round the sun. LA TRÉMOUILLE. What an utter fool! Couldnt he use his eyes? That's the quote I was looking for, except I remembered them as having mentioned Copernicus, not Pythagoras; good thing I looked it up. current reading: Stonehenge book, some odds and ends by Shaw. So, first it rains, then it pours, as they don't say in Bree. Or in this case, having gotten to see the Tolkien Exhibit in the Bodley on a quick trip to Oxford, today I started a one-month stint with the manuscripts in the Marquette Archive. Today was the first day and it feels like I'm off to a good start, trying to sort out the manuscript sequence that records Tolkien's resumption of work on LotR after his break by Balin's tomb. I brought with me three book: UNCLE CURRO: JRRT'S SPANISH CONNECTiON, which I'm now reading; the new edition of THE FALL OF GONDOLIN, which I've been looking for the chance to dig down into; and Raymond Edward's underrated TOLKIEN biography, which I skimmed a year or two ago and wanted to read and absorb. Plus a plethora of other titles on the Kindle, where I'm currently reading about recent excavations at Stonehenge and the vicinity. And now two books by Bernard Shaw checked out of Marquette's Memorial Library, one of which is to look for a quote I remember from reading the play SAINT JOAN back in graduate school and the other a collection of short stories (who knew that Shaw wrote short stories?). I've never read one of Shaw's famous Prefaces before, so that shd be interesting. And after an evening being interviewed about old TSR days I got to wrap up the evening watching a Bodleian podcast (or 'bodcast'): a forty-two minute presentation by Tom Shippey on Tolkien as Morris-ian and philologist*, which I v. much enjoyed. Shippey was in fine form, full of interesting information presented through strong opinions. Highly recommended. I even learned more about two new forthcoming Tolkien books: TOLKIEN'S LOST CHAUCER by Jn Bowers, which I knew was in the works but nothing more than that about it, and TOLKIEN'S LIBRARY by Cili Oronzo, which was wholely new to me. More good things on the way. *thanks to Bill F. for the link.